NorthwesTel Archives · Stop the Cap! More than three years after Canadian regulators required Bell Canada’s northern subsidiary, Northwestel, to undertake a $233 million modernization and upgrade plan, the CRTC has ruled the company is overcharging consumers for Internet access and has ordered rate cuts. Customers in Nunavut, the Northwest Territories and Yukon pay some of the highest prices in the world for DSL Internet access, more than three times higher than what comparable broadband costs in southern Canada. The CRTC has found those prices unjustifiable, especially after its 2011 finding that Northwestel enjoyed strong financial performance while chronically underinvesting in its network. The CRTC decision requires the company to cut prices for its DSL Internet 5 (5Mbps/512kbps) and DSL Internet 16 (16Mbps/768kbps) in N.W.T. and Yukon by 30% this May. Northwestel’s budget plans DSL Internet Lite (768/128kbps) and DSL Internet 2 (2.5Mbps/384kbps) will be reduced in price by 10 percent. Customers of Northwestel’s most popular DSL plans pay between $65-90 a month for 2.5 or 5Mbps service with usage caps of 40 and 125GB per month, respectively. Customers will also no longer face a $20/month broadband-only surcharge if they don’t want landline service and Northwestel’s overlimit fee, now $2-3/GB in the Northwest Territories, will be cut by at least $0.50/GB. Because of the company’s past pricing practices, Northwestel will not be permitted to increase residential Internet rates until the end of 2017 at the earliest, and will need CRTC approval for any other rate increases. 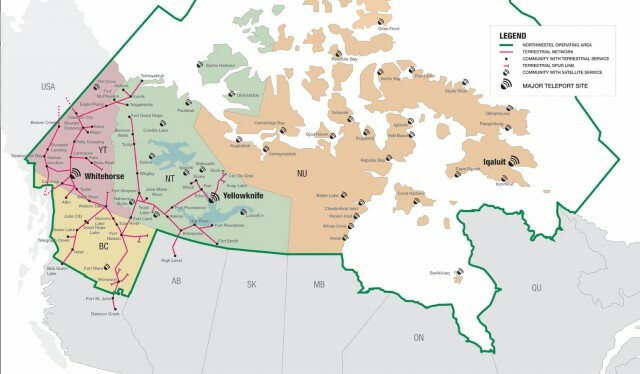 Northwestel’s operating service area includes the Yukon, Northwest Territories, northern British Columbia and Nunavut. Residents in the northwestern and north-central regions of Canada have complained for years about poor service and high prices charged by Northwestel for Internet access. At a 2013 hearing, Blais heard from a number of angry residents upset about Northwestel’s performance. “I know you are frustrated; we heard it from the interveners, but we’ve pushed things considerably,” Blais said at the time. Customers are also frustrated by the fact the company receives over $20 million annually in federal subsidies, but those benefiting the most from Northwestel’s finances are its shareholders. Native communities in isolated areas of northern Canada have learned it is better to build their own networks than wait for promises from Northwestel to be fulfilled. The K’atl’Odeeche First Nation built its own fiber network on its reserve in Hay River, N.W.T. after Northwestel reneged on an agreement to improve existing DSL service. Today, the native community gets better Internet access than the rest of Hay River, and the community is willing to share their enhanced Internet connectivity with Northwestel for the benefit of others nearby if the company would agree to connect to it. “We saved them millions of dollars in infrastructure upgrades and I think it’s only fair that they lease a small portion of that infrastructure for them to meet their CRTC mandate,” said Lyle Fabian, the IT manager for the First Nation. Fabian believes other First Nations should strive for broadband self-sufficiency by also building their own networks to take control of their digital future. In almost every case, Fabian said, those networks will deliver better service than what is on offer from Northwestel. While the CRTC-ordered rate cuts will help customers in the Yukon and Northwest Territories almost immediately, Internet access in satellite-based Nunavut will continue to be exorbitantly expensive until the CRTC completes a review of those rates. Nunavut residents pay $179.95 a month for 5Mbps/512kbps service with a 30GB usage cap. More than two dozen NorthwesTel customers in Canada’s north are contemplating a class-action lawsuit against their Internet provider after being charged hundreds, if not thousands of dollars in overlimit charges for phantom traffic nobody can seem to identify. Kyle Jennex of Whitehorse has always checked his usage, particularly because NorthwesTel charges very high prices for access and has a low usage cap. Running over a plan limit can prove costly at $5 per gigabyte. In November, Jennex discovered NorthwesTel’s usage meter was registering between 5-7GB of mysterious upload traffic every night even after the computer was physically disconnected from his Internet connection. Despite complaining to NorthwesTel, the company billed him for nearly $1000 in overlimit fees, claiming he exceeded his allowance by nearly 200GB. NorthwesTel has never suspected their meter of being responsible for the phantom usage measurements. To Curtis Shaw, NorthwesTel’s vice president of marketing, excess usage is entirely the customer’s responsibility. The company told Jennex his high usage was likely caused by torrent/peer-to-peer network traffic or a neighbor who had hacked into his password-protected Wi-Fi network. But neither explanation can account for usage that continued to rack up with nothing connected to his Internet modem. Shaw recommends NorthwesTel customers shut down their computers when not in use, particularly overnight, to avoid excess charges. He also advises customers to change their passwords, regularly check usage, and install and update anti-virus software on their computers. Shaw also says users can sign up for e-mail that notifies customers when they approach their limit, “really to protect people from receiving a surprise bill.” He adds the company does monitor customer usage and has called customers in the past when their accounts show an unusual amount of activity. But NorthwesTel didn’t bother to call a customer in Whitehorse who reports he was billed an extra $990 for the extra 198GB of usage he claims he never used. Nor did the company call the woman in the Northwest Territories bill shocked with $3,000 in overlimit fees in a single month. The company says there have been repeated cases of neighbors “sharing” Wi-Fi connections which can quickly run up usage. But Jennex, who says he well understands the danger of unprotected Wi-Fi, believes he has taken the necessary precautions and has been overbilled anyway. The company cannot or will not trace Jennex’s mysterious web traffic to identify the source, confident their meter is accurate. Besides, the company says, customers often underestimate the amount of traffic they consume using file sharing programs or watching video online. The company claims it worked hard on its usage meter and it received industry approval for its high degree of accuracy. But providers need not submit their meters for independent verification or subject them to periodic audits to verify meter accuracy. NorthwesTel does not have a good record on meter accuracy. 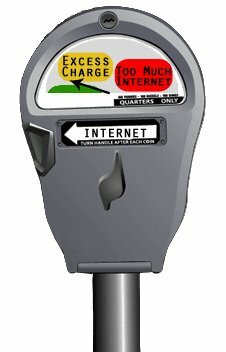 In 2010 the company was forced to admit it had overbilled hundreds of customers over a “meter glitch” when usage monitors were not reset. As a result, customers found enormous overlimit fees attached to their bills. In one example, a customer was charged a $2,500 overlimit fee on top of his usual bill of $88. A glitch may indeed be part of the problem as one Yukon customer successfully confronted NorthwesTel for erroneous overlimit fees for consumption of data that was impossible to accrue at the speed of his Internet connection. Angry customers complain that with so little competition, NorthwesTel has every incentive to play fast and loose with its meter, either because customers will cut their usage, upgrade to a higher cost tier with a bigger allowance, or pay the overlimit fees. Customers who believe they were unjustly billed overlimit fees should take their case first to the Office of the President. Failing that, they should appeal to the Commissioner for Complaints for Telecommunications Services, an independent agency that has a good track record of winning relief. Some customers fear the expensive overlimit fees so much, they are following NorthwesTel’s advice and keeping their computers switched off when not being used, but that isn’t a good enough answer for Jennex, who plans to continue the fight. “There’s no need to rip us off because we live so far North,” he told CBC North. After years of inaction, northern Canada will finally see improved telecommunications services that the rest of us have taken for granted for at least a decade. Under a plan developed by the Canadian Radio-Television and Telecommunications Commission (CRTC), NorthwesTel (a Bell Canada subsidiary) will spend $233 million by 2017 to improve Internet service and bring other telecommunications services into the 21st century. At present, many communities still lack phone features like caller ID, call waiting, and three-way calling. Dial up access remains common and landline based broadband from DSL remains spotty. Larger communities like Whitehorse can obtain broadband at speeds up to 100Mbps, however. The eastern Arctic regions, including Nunavut, rely primarily on satellite broadband while those in the western Arctic can access a mix of DSL and Wireless ISP services in more populated areas and settlements. Cell phone service is available in some areas, but reception doesn’t hold up once customers roam outside of town. Mobile broadband upgrades are anticipated to make 4G home broadband a possibility, although it is likely to be expensive and usage-capped. Telecom analyst Iain Grant told the Canadian Press NorthwesTel’s plans to upgrade it services are long overdue. Grant is a proponent of fiber broadband access over satellite and reminded the CRTC a Canadian company called Arctic Fibre is working on a fiber optic route across the Canadian Arctic that will connect China to Europe. The CRTC has been unimpressed with the Bell Canada subsidiary’s performance, noting the quality of service is well behind the rest of Canada. The Commission has placed a four-year price cap on services and has broken up NorthwesTel’s near-monopoly on service by ordering it sell landline, Internet, and other voice services separately, which opens the door for new competitors to emerge. New entrants could either develop their own networks or resell service purchased wholesale from the phone company. The CRTC heard numerous complaints from northern residents during hearings held in the region earlier this year. Common complaints included inadequate access to broadband, expensive and outdated telephone service, and no competition in parts of the region. Residents also complained about poor cell service. One competitor that has specialized in cellular service in northern Canada, Ice Wireless, announced it is spending more than $12 million to upgrade its network in Yukon, the Northwest Territories and Nunavut, introducing mobile data service for the first time. NorthwesTel serves the Yukon, Northwest Territories, Nunavut and northern parts of British Columbia and Alberta.